Fertilising isn’t just for avid gardeners; it should be done by everyone with a garden, lawn or plants in order to keep them healthy and thriving. In Queensland’s climate, we have the opportunity to grow a wide variety of species in our yards. However, non-native plants, as well as turf often need a little extra help in order to get the nutrients they need and fend off pests and diseases. Luckily, with the right products, it’s easy to supplement your garden with the right nutrients that will keep your turf, plants and garden beds looking luscious and healthy all year around. The benefits of fertilising don’t just stop at your greenery; it also improves your lawn’s water retention. This means your grass and plants effectively absorb more water and therefore need less watering, which saves you time and money. The best way to care for your lawn? Watering deeply less often and fertilise in small amounts more often. This way, your lawn won’t have large deposits of chemical fertiliser running off into waterways. Fertilising every two months or so will guarantee strong roots, consistent growth and a lovely and full green colour. It’s also important to ‘water-in’ your lawn when fertilising, this is what assists the lawn in absorbing the nutrients the fertiliser provides. 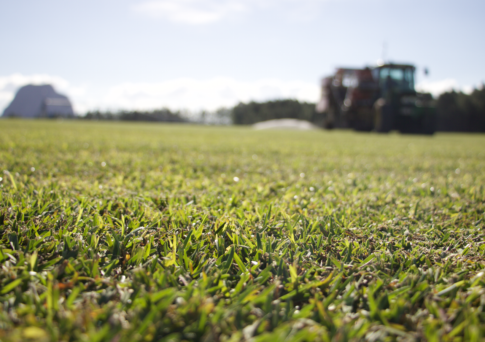 As the largest independent turf grower on the Sunshine Coast, we know how to nurture your lawn the right way, keeping your turf looking lush and green all year around. Our new fertiliser range, GoTurf Pro, is the fertiliser we developed for growing the turf on our farm. It has bioactive ingredients specifically tailored to condition your lawn and has a proven track record throughout Australia. For more information on our GoTurf Pro range, or to order your fertiliser today, contact our friendly team on 1300 781 175 or send an enquiry through our website.